Fuksas explained that a building’s exterior is simply something that the architect discovers as the project concept develops with the design. He said a piece of architecture is like a sculpture that is drawn from a mass and is formed through research, trial, and error until a final work of art is realized. To Massimiliano Fuksas, the end result is something mysterious. One thing that the architects do aim to have control over is emotion. 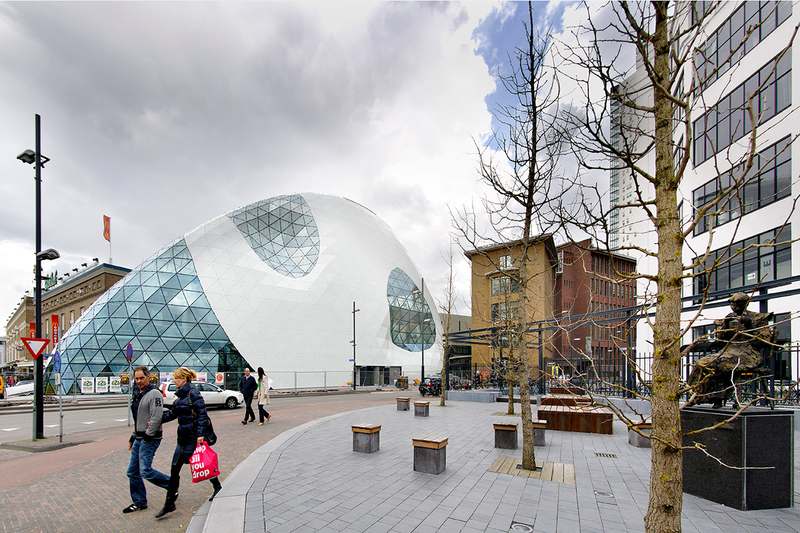 In the case of Studio Fuksas’s projects located in dense urban environments, such as the 2010 Admirant Entrance Building in the Netherlands or the 2010 Rome-EUR Convention Center, the light and surrounding contexts reflected through the glass curtain walls project a happy tone for visitors both outside and inside the buildings. They expose the buildings’ skeletal envelopes, which allow people to clearly see the structures’ raw materials. 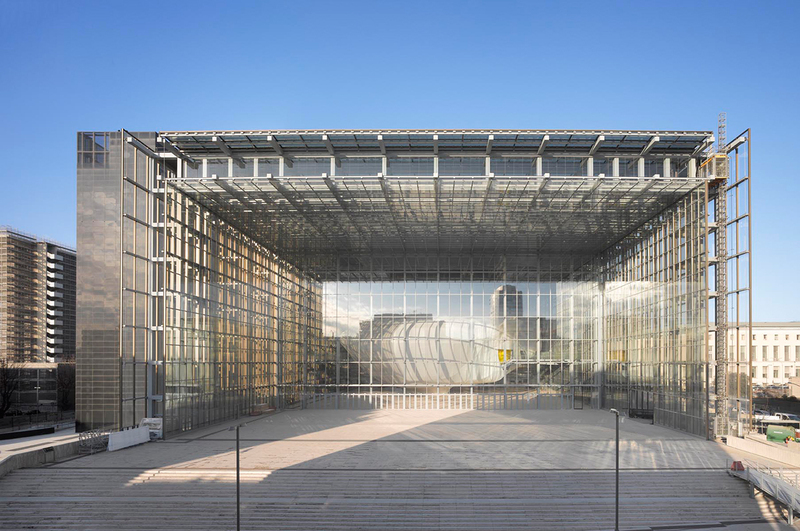 “For the convention center, we built a container using a steel structure and a double glass facade that encloses the cloud, which you can see from the outside,” said Massimiliano. Studio Fuksas’s 2009 St. Paolo Parish Complex in Foligno, Italy, though a concrete cube, still utilizes light through unique cutouts that don’t fully brighten the entire interior, but instead create a thoughtful, soft environment for reflection. 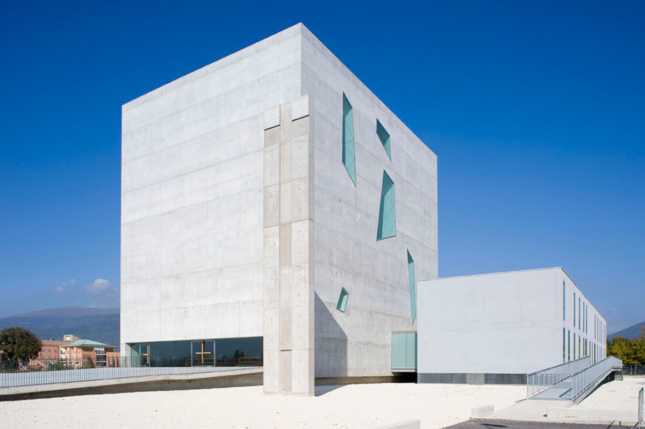 Massimiliano and Doriana Fuksas noted that the facade of the chapel is sliced at the bottom with a glass entrance. A visitor’s gaze moves from one side to the other side of the building in an effort to understand the windows across the various faces. 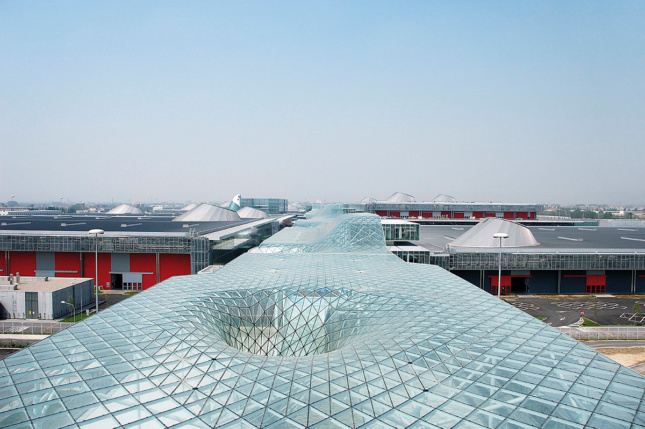 One of the most important components of Studio Fuksas’s work is sustainability. Details are designed to boost energy savings and reduce carbon emissions throughout buildings’ lifetimes. Of course, this is a key aspect of designing advanced facades, and one that all of the Facades+ New York speakers showcased through their work. The Gensler team behind the recently completed renovation of Manhattan’s Ford Foundation building, along with Heintges Consulting Architects & Engineers, spoke about how to best maintain and improve the envelopes of mid-century icons. Representatives from Columbia University, Renzo Piano Building Workshop, and Permasteelisa Group discussed the newest additions to the university’s Manhattanville campus, all which have vitreous skins. Toshiko Mori, who gave the day-one afternoon keynote speech, challenged the crowd by expanding the topic of facades to the greater building envelope and the importance of the fifth facade, the roof. All these exterior elements, she explained, have a monumental impact on the performance and identity of a piece of architecture. Other symposium talks featured experts in net-zero building enclosures, climate responsive facades, and the changing international regulations in envelope construction. Juergen Riehm, founding principal of 1100 Architect, served as the co-chair of Facades+ New York and moderator for every panel.